What is the Honest John Fuel Cost Calculator? 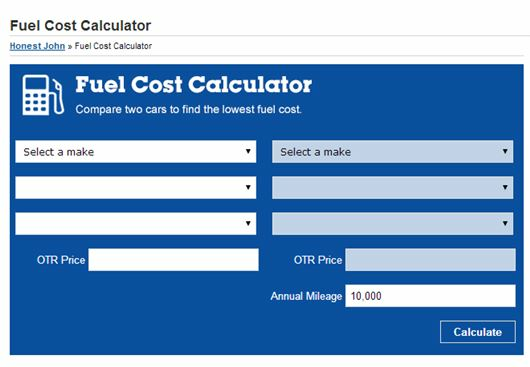 The HonestJohn.co.uk Fuel Calculator is a simple money saving tool that lets car buyers compare different cars to find the lowest fuel cost. It features every make, model and trim of car on the UK market. How do I use the Fuel Calculator? The Fuel Calculator is simple and easy to use. Basically, it compares two cars to find the lowest fuel cost. The tool spans all makes and models, and then displays the information in an easy to understand layout with the cheapest car appearing in a green summary box. Am I limited to the number of cars I can compare? There’s no limit to the number of cars you can compare. Obviously, comparing every make and model of car is a complicated task, so we’ve limited the Fuel Calculator to compare just two cars at any one time. We think this easiest way to display the information, without bombarding users with dozens of facts and figures. How does the Fuel Calculator work? To drill down the numbers and provide the most accurate readings, the calculator factors in some essential variables: car price, fuel type, average consumption, CO2 emissions and VED. By doing all this, the calculator can work out a car’s cost per 10,000 miles and then compare it with another to produce the lowest fuel cost. Am I limited to just 10,000 miles for comparisons? No, 10,000 miles is the default setting the Fuel Calculator operates by. You can change the average mileage to whatever figure you want to ensure it reflects your real world motoring. Can I compare hybrid and electric cars? Yes, the Fuel Calculator will let you compare all powertrains - petrol, diesel, hybrid or electric. It will also factor in electric grants and battery hire, should it apply to the electric car in question. Will the fuel calculator factor in congestion charging? Yes, the Fuel Calculator will work out London congestion charge savings if the car in question qualifies for exemption. Official fuel consumptions aren’t always accurate. Will the Calculator factor in real world economy? We’ve plugged the calculator into our Real MPG database. This allows the calculator to give two fuel consumption readings – official MPG and Real MPG – which lets buyers get a better understanding when it comes to comparing how many miles a car will do the gallon. Visit the HonestJohn.co.uk Fuel Cost Calculator and have a go for yourself. We think you’ll be surprised at what you discover.